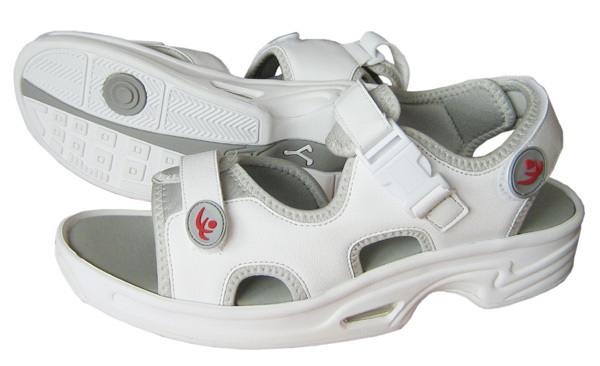 The Chung-Shi Sandal Relax-Step is a shoe with optimum fit suitable for men and women with optimum fit. Its mesh material and low weight make for comfort and breathability. The nubuck leather insets on the forefoot, the sides and the heel area provide excellent shock protection. The Chung-Shi Relax-Step is made from high quality and washable calf leather with lining. Despite its slender look, this shoe has a comfortable toe area and offers optimum fit and wearing comfort. As the picture alongside illustrates, the Relax-Step stimulates a pressure point during the flexing action of heel and toes, which on top of the effect of the acupressure (kidney and gastrointestinal tract) fosters the legs' supply with blood. The Relax-Step is functional due to its AuBioRiG sole system. The ergonomically shaped sole (15° rounded angle) stabilises and automatically ensures that the right flexing action and a straight posture are maintained. The Stafild professional sole provides optimum grip in various weather conditions. Regarding the Relax-Step, the toes - opposite to when wearing ordinary shoes - should almost touch the shoe at the front. Due to the middle foot-roll the foot is pulled backwards and thus provides the correct rolling motion. We therefore advise ordering the Relax-Step a size smaller than yor usual shoe size!